Posted by Dave Emory ⋅ February 7, 2018Post a comment Email This Post Print This Post Tweet This! Attendees at the invite-only conference were told about the location at the last minute and asked not to mention it to anyone. Conference participants are inextricably linked with the Nazi/”Alt-Right” milieu. The confluence of Manson/Nazi cultists with esoteric Nazism, highlighted in, among other programs, FTR #’s 991 and 992.
Review of Manson victim Sharon Tate in the Los Angeles area campaign of Robert F. Kennedy. Review of Robert Kennedy’s statement to Tate and her husband Roman Polanski (as well as others) that he would re-open the investigation into his brother’s murder after getting to the White House. Review of the probable Manson family authorship of the murder of Marina Habe, daughter of anti-fascist writer Hans Habe. Review of the affinity between the brilliant Nazi hacker Andrew Auerenheimer aka “Weev” and the Atomwaffen. Review of Weev’s participation in Glenn Greenwald and Laura Poitras’ party celebrating their receipt of the prestigious Polk award. 1a. In FTR #967, we highlighted the Nazi group Atomwaffen, some of whose members were plotting an attack on a nuclear power plant. New articles on the group disclose that they have been responsible for a number of recent murders around the country. More murders should be expected because Atomwaffen produces ISIS-style videos promoting mass neo-Nazi violence designed to sabotage and implode society. FTR #888 details the work of Glenn Greenwald in running legal interference for the leaderless strategy advocated by the likes of James Mason and the National Alliance. Specifically, Citizen Greenwald freed up the likes of Atomwaffen et al from civil liability for their media exhortations to violence and murder. “California Murder Suspect Said to Have Trained With Extremist Hate Group” by A.C. Thompson, Ali Winston, and Jake Hanrahan; Pro-Publica; 01/26/2018. While many of the new white extremist groups have consciously avoided using Nazi imagery, Atomwaffen has done the opposite. The name can mean “Atomic Weapons” in German, and the organization embraces Third Reich iconography, including swastikas, the Totenkopf, or death’s head insignia, and SS lightning bolts. The group frequently produces YouTube videos featuring masked Atomwaffen members hiking through the backcountry and firing weapons. They’ve also filmed themselves burning the U.S. Constitution and setting fire to the American flag at an Atomwaffen “Doomsday Hatecamp.” . . .
1b. In FTR #437, we highlighted counter-culture fascism and the penchant of some to promote fascist outcroppings like the Manson cultists to bohemians. In FTR #809, we examined the wider political context of the Manson family killings, including the possible killing of Marina Habe. Sharon Tate, along with her husband Roman Polanski, were two of the key organizers of Robert F. Kennedy’s campaign in the L.A. area. Shortly before Bobby’s assassination, he disclosed to dinner guests at a function at the Tate/Polanski residence that, after his election, he would re-open the investigation into his brother’s murder. The ‘Alt-Right’ overlap Charles Manson’s hopes and dreams. Atomwaffen openly worships him. “The Maniac Neo-Nazis Keeping Charles Manson’s Race War Alive” by Luke O’Brien and Christopher Mathias; The Huffington Post; 11/21/2017. “UCL to investigate eugenics conference secretly held on campus” by Kevin Rawlinson and Richard Adams; The Guardian; 01/11/2018. 2b. Eugenics conference organizer James Thompson was fully aware of the nature of the individuals he’s inviting to his invite-only annual secret conferences. His colleagues/attendees are birds of the same feather as James Mason et al. “Exposed: London’s eugenics conference and its neo-Nazi links” by Ben Van Der Merwe; London Student; 01/10/2018. James Thompson, the honorary UCL academic who acts as the host of the conference, is a member of the UISR Academic Advisory Council. His political leanings are betrayed by his public Twitter accoun, where he follows prominent white supremacists including Richard Spencer (who follows him back), Virginia Dare, American Renaissance, Brett Stevens, the Traditional Britain Group, Charles Murray and Jared Taylor. Another major organiser of the LCI is Emil Kirkegaard, who has attended all four conferences and even designed the website. Although he refers to himself as a “polymath” and Thompson describes him as a “very bright young guy”,, Kirkegaard is not an academic. His highest qualification is a Bachelor’s in linguistics. 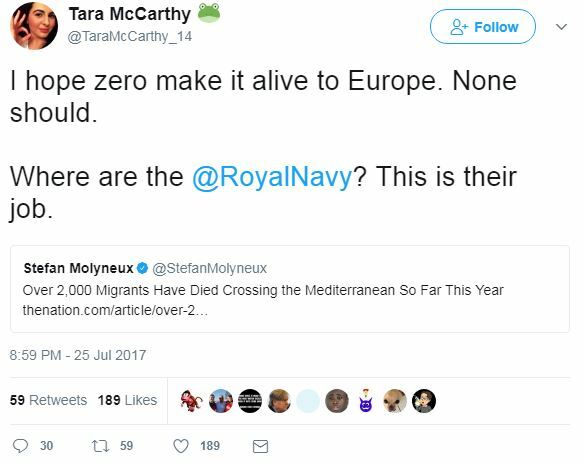 Kirkegaard’s reputation as a scientific advocate for neo-Nazism was increased last April when he appeared on Tara McCarthy’s ‘Reality Calls’ to discuss “the future of eugenics.” McCarthy was banned from YouTube for alleging a Jewish conspiracy to commit “white genocide”, supports deporting naturalized citizens and “killing them if they resist”, and said that she hopes “zero” migrants crossing the Mediterranean “make it alive”..
Kirkegaard is not the only LCI speaker to feature on McCarthy’s show. Adam Perkins of King’s College London appeared on the show to discuss his controversial book, ‘The Welfare Trait’. He provoked uproar last year when he shared images of data from one of Kirkegaard’s papers on immigrant crime rates, with the caption “Trump’s Muslim ban makes sense in human capital terms”..
“The Nazis’ First Victims Were the Disabled” by Kenny Fries; The New York Times; 9/13/2017. So Cruz participated in Republic of Florida (ROF) “training exercises.” And what kind of training might that be? This is a good time to recall the story of the Atomwaffen member who wanted to attack a nuclear plant near Miami for the purpose of causing a meltdown, clearing out the eastern seaboard, and building a new Fourth Reich. And also a good time to recall the stories about how Atomwaffen creates ISIS-like videos of them training in the woods and the Atomwaffen “training camps” include instruction in firearms, hand-to-hand combat, camping and survival skills. All in all, if this group wasn’t an extension of Atomwaffen, they’re pretty clearly close allies. Both of your most recent comments are characteristically important and underscore a key point I’ve been making about Citizen Greenwald. His association with Auerenheimer appears much more than cypherpunk/libertarian. Greenwald ran legal interference for the “lone wolf/leaderless resistance strategy,” freeing advocates of this type of mayhem from civil liability. But for Greenwald’s efforts, the families of the victims and surviving victims themselves might have been able to sue Jareb and the ROF. This AP Article, printed in the Dailey Mail, 02/16/2018. It talks about how a country with liberal Euthanasia laws is strating to abuse the protections and killing unwilling victrims without following the procedures and protections. It shows how the abuses can become commonplace and institutionalized, once the slipper slope begins to diminish the value of life or put a price on it. The patient, whose identity was not disclosed, was euthanized at the family’s request, according to Vanopdenbosch’s letter. There was no record of any prior request for euthanasia from the patient. ‘This was not a case of illegal euthanasia but rather a case of legitimate end-of-life decision improperly considered by the physician as euthanasia,’ Genicot and Distelmans said in an email. Though no one outside the commission has access to the case’s medical records – the group is not allowed by law to release that information – some critics were stunned by the details in Vanopdenbosch’s letter. Kristof Van Assche, a professor of health law at the University of Antwerp, wrote in an email the commission itself wasn’t breaking the law because the group is not required to refer a case unless two-thirds of the group agree – even if the case ‘blatantly disregards’ criteria for euthanasia. But without a request from the patient, the case ‘would normally constitute manslaughter or murder,’ he wrote. ‘The main question is why this case was not deemed sufficiently problematic’ to prompt the commission to refer the case to prosecutors. Vanopdenbosch wrote that when cases of euthanasia are identified that don’t meet the legal criteria, they are not forwarded to the public prosecutor’s office as is required by law, but that the commission itself acts as the court. ‘It can obviously occur that some debate emerges among members but our role is to make sure that the law is observed and certainly not to trespass it,’ they said. They said it was ‘absolutely false’ that Vanopdenbosch had been muzzled and said they regretted his resignation. * Authorities uncovered a possible plot to blow up a nuclear facility near Miami. * Members have discussed using explosives to cripple public water systems and destroy parts of the electrical power grid. One member even claimed to have obtained classified maps of the power grid in California. Throughout the chats, Atomwaffen members laud Timothy McVeigh, the former soldier who bombed the Alfred P. Murrah federal building in Oklahoma City in 1995, killing 168, including numerous children. Charleston church shooter Dylann Roof and Anders Breivik, the Norwegian extremist who massacred 77 people, also come in for praise. * Joining us means serious dedication not only to the Atomwaffen Division and its members, but to the goal of Total Aryan Victory. * Atomwaffen held a three-day training session — or “Hate Camp” in the group’s parlance — deep in the Nevada desert. * Hubsky also discussed blowing up natural gas lines. * [T]he National Socialist Underground, a German organization that carried out a massive terror spree between 2001 and 2011, robbing 14 banks, planting bombs and murdering 10 people, most of them immigrants. “The NSU was pretty cool,” Woodward wrote. * Atomwaffen actually stood to benefit from the increased notoriety stemming from Woodward’s affiliation with the neo-Nazi group and the Bernstein murder. The chat logs show that Denton and other Atomwaffen figures are in contact with Mason, who is 65 and is said to be living in Denver, Colorado. “Now he’s got a following, which he didn’t have for the last 30 years,” Kaplan said. “He’s got some kids who’ve rediscovered him. As Kaplan sees it, groups such as Atomwaffen — would-be Nazi guerrillas devoted to white revolution in the U.S. — are “akin to cults,” and are propelled by a quasi-religious faith that they will ultimately prevail. The former member said Denton envisions using this network of Atomwaffen compounds to launch attacks against targets in the U.S.
Hubsky also discussed blowing up natural gas lines. …he had retained a lawyer. Members would now be required to join Front Sight, a “private combat training facility” outside of Las Vegas in the small desert town of Pahrump. Front Sight, the memo said, could provide classes in “Uzi and full auto M16 combat, as well as knife fighting, hand to hand combat,” and instruction in climbing and rappelling. Fernandez, who used the alias Wehrwolf, believed that Atomwaffen actually stood to benefit from the increased notoriety stemming from Woodward’s affiliation with the neo-Nazi group and the Bernstein murder. This article is about missing plutonium that has not been disclosed to the public. Plutonium, radioactive cesium and several radiation detectors were stolen from a rental car parked in this lot outside of a San Antonio hotel. While the Idaho National Laboratory depicted the site of the theft – a Marriott hotel parking lot — in a report to the Energy Department as a secure spot with high walls on two sides, a clear line of sight to the hotel’s front door, and patrolling guards, San Antonio police statistics show that theft was just one of 87 at the Marriott hotel or its parking lot in 2016 and 2017.